Ramnik started training at the gym when he was 26 years old. Like a lot of people, he wanted to get lean… but his main goal was to improve his overall wellbeing. For Ramnik, training is less about vanity and bulking up and more about de-stressing and being healthier in every sense of the word. Ramnik started his Flexible Fitness membership 7 years ago, with a free One2One Programme at Ken Martin Leisure Centre. Throughout the four sessions, Angie, one of the fitness advisors, provided tailored advice and support. Soon, Ramnik started circuit training classes and began to take his fitness more seriously – learning about anatomy and nutrition through online research and talking to his trainers. He’s since gone on to participate in triathlons and other endurance Obstacle Course Race events, and he’s currently training for Tough Mudder in May this year. Ramnik makes use of his Flexible Fitness membership 3–6 times a week, at leisure centres across the city. 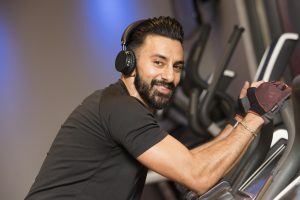 Though he mainly uses the gyms – for bodyweight training, HIIT, spinning, and running – Ramnik also enjoys swimming occasionally and relaxing in the health suites. 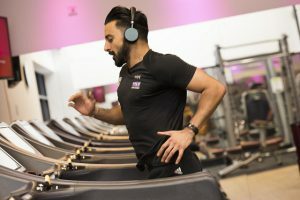 He’s now taken his interest in fitness to the next level, having started a Level 2 Diploma in Fitness Instructor, with plans to progress to a Level 3 in Personal Trainer next. When he’s not working, training or studying (! ), Ramnik is a busy dad to his 4-year-old daughter. Taking after her dad, she’s already completed Notts Gym Tots Level 1 and run a 3k to raise money for breast cancer research! If Ramnik’s story has inspired you, check out Flexible Fitness today and take the first step towards a healthier, fitter, happier you.